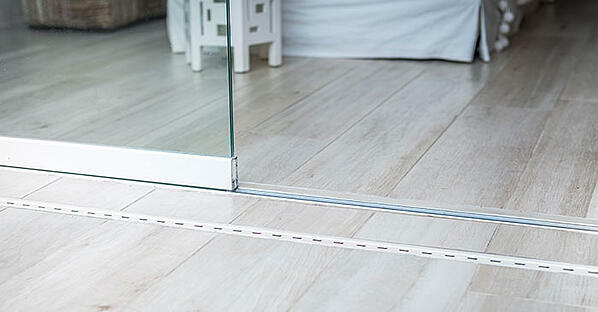 Unlike most sliding glass doors, where the panels are bottom-rolling, the Cover Glass system uses a unique track system. Our specially-designed glass panels suspend between an upper and lower profile, which has many advantages regarding aesthetics, customizability, and function. How Does the Upper and Lower Profile of our Bi-Fold Glass Doors Work? Each panel of the Cover Glass system is fixed in place with stainless steel fasteners, leading to a secure fit. Attached to wheels, the panels slide along the inside of the frameless glass door tracks, which measure 1 ¾ inches in width by 2 ¼ inches in height -- allowing for a wide variety of layouts, with panels stacking to the interior or exterior and sliding both left and right. Clients can even request that the lower tracks of their sliding glass system sit flush with the floor, eliminating the need to step over anything when moving between indoors and outdoors. This makes the space more flexible and adds to the sense of expansion. Even when tracks are recessed, water is kept out of the system due to the use of customized weep holes or drain pipes — whatever is more appropriate to your property. In fact, under normal conditions, our bi-fold sliding door system is completely weatherproof. What Materials Do the Bi-Fold Sliding Glass Systems Use? Several materials make up sliding glass doors. The metal parts are all made from noncorrosive stainless steel, except for the tracks, which are made from aluminum. Tracks come in a variety of colors, with the standard colors white, black, bronze, and silver. The AL profiles (made in compliance with DIN1748) protect you from weather conditions with either powder coating or Kynar finish. Clients choose what is most appropriate for their climate. Panels are made from tempered, laminated, Low-E glass, which is five times stronger than regular glass, are more energy-efficient, and prevent UV light from entering the property once the Bi-fold glass is closed. Clients can choose between four different colors for their glass: clear, bronze, blue, and grey. Finally, weatherstrips are made from UV-protected polycarbonate and other accessories from polymer. Before a client can receive a Cover Glass system, it is necessary for the client or a contractor to create a clear opening. This needs to be free from anything that could obstruct the tracks. Clients also need to leave the header and sides exposed. 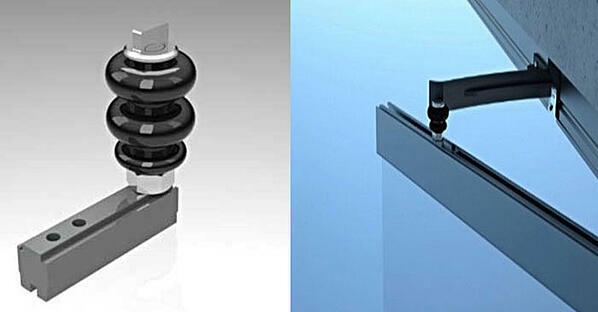 Finally, those who want recessed bottom tracks need to provide a cut in the floor, using instructions from Cover Glass. The first is weatherproofing, installing the sliding glass door drainage system and laying out the track, which may involve drilling weep holes. After this, we laser measure the space for glass. The second step is the installation of the panels, around 10 to 12 business days later. 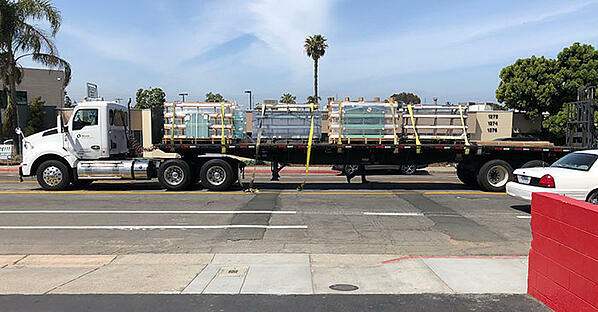 It takes around one day to install 18 feet of track or glass. After the installation is complete, clients can choose to cover the top and side jams or leave them exposed. This is possible because all the parts run on the inside of the profile. All the above is only possible because of the unique frameless glass door tracks of the Cover Glass system. With traditional sliding doors, it is impossible to have a recessed bottom track and to stack panels. Furthermore, most other systems lack the customization options, weatherproofing, and water protection of Cover Glass. Want to learn more about our Bi-Fold Frameless Glass Doors?